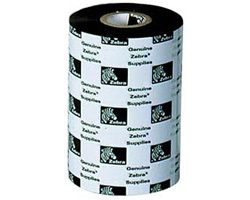 Zebra 5319 Black Wax Ribbon for Industrial Printers (3.27 Inch x 1476 ft; 6 Rolls/Case). A Wax ribbon for printing high-quality, durable barcodes. Offers unmatched printing for both visible light and infrared scannability. Excellent performance on tough-to-print uncoated and uneven tag stocks, including Tyvek. Prints at speeds up to 8 inches per second.